The living room is the heart and business card of your home. It is here that the whole family gathers in the evenings for joint rest and pastime. Therefore, it is necessary to design it carefully, taking into account all the nuances and major trends. This is also not easy to do because it often happens that the living room is combined with other functional areas. 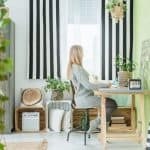 In small apartments, it can also serve as a bedroom; the one who works at home is a cabinet; in the studio – dining room. Therefore, the design of this room must be chosen, taking into account not only the wishes of the owners regarding the stylistic features, but also depending on what function the room will perform. The rhythm of life of a modern person is very impetuous. We are constantly in a hurry, we combine several things, we saturate our day with various events, trips, meetings, etc. That is why in the evening, coming home, I want to plunge into the atmosphere of comfort and peace. That is why many people are very demanding about the design of the living room. Indeed, in addition to the fact that this room performs certain functions in the house, staying in it should bring comfort and rest. A large amount of light. A modern living room is presented today as a room with a lot of natural light. Often, for this set large or even panoramic windows. Such a room looks spacious, even if the footage is not. Spaciousness. Now it is almost impossible to meet the living room with various screens and partitions. This results from the fact that besides sunshine, in the room air has to circulate also. If you own a small room, try combining it with a kitchen. 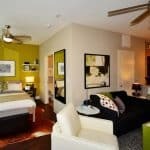 The idea of a studio apartment has been relevant for many years, because it creates the illusion of expanding the area. Minimalism. A couple of decades ago, it was fashionable to have large sofas, sideboards, TV stands in the rooms. In addition, various decorative elements were used – statuettes, luxurious paintings, long massive curtains. But a few years ago we received such a concept as minimalism in the interior. During this time, it firmly settled, and now more and more people prefer to get rid of excess rubbish so that the room can “breathe”. Therefore, it is better to establish the minimum amount of furniture in the living room, and to use such decorative objects that also have a practical function (watches, mirrors, lighting devices, etc.). Environmental friendliness. A very necessary and useful trend, which says that all objects located in the room should be made of natural ingredients in order not to harm your health. To do this, use as many elements made of natural wood and textiles. Light shades. Also, as well as a large amount of light, the design of the ceiling and walls with light colors will help to visually enlarge the room. In addition, with such a base, various bright accents look good, which can be changed at will and in mood. Against the background of the walls, made in a quiet neutral shade, the colored elements of the decor can become a real highlight of the room and make a bright impression on your guests. Separately, it should be noted that the rational use of the budget is quite relevant. Today it is not particularly fashionable to decorate the rooms too pretentious and luxurious. On the contrary, minimalism, popular among designers, will help not only to significantly save on repairs, but also to get a unique and stylish rest room after a working day. As mentioned above, there are situations where the living room combines the functions of two or more rooms. This happens in small houses or in studio apartments. Then, besides a place to rest, it is necessary to include a sleeping / dining room / work area. In this case, you just need to know how to correctly and, avoiding the loss of already small space, to place all the components. A room that harmoniously combines several functional areas, designers are often called the studio. This format of the room is popular for several years. By combining several segments of the house, it is possible to create a comfortable, spacious and bright room. Especially this technique is relevant for the owners of a small apartment, where extra walls and partitions only take up space. You can combine the living room with a kitchen, while highlighting a separate dining area. In this case, the zoning is due to furniture, lighting fixtures or carpet. For example, a dining table will mark the place of a meal, a large carpet – a seating area. Finishing the same should be the same for the whole territory. Thus, you will manage to harmoniously dispose of the area, organizing seemingly one space, but with different functionality. For those who work or study at home, it is important to have a special corner for the desktop and shelves (for storing documents). 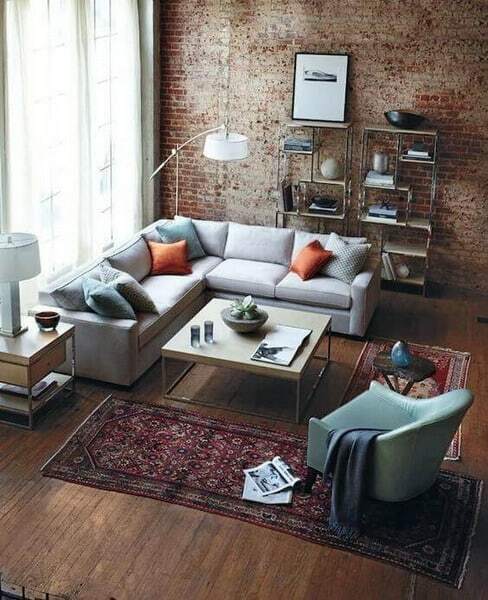 If you can not allocate a separate room for the study, perhaps in your living room there is a little space for it. Modern furniture manufacturers offer tables of different shapes and sizes, so you can choose the option that fits perfectly into the living room (round, square, rectangular or corner model). Many tables already have special lockers for storage. However, if you need to place a large number of books, you can purchase small shelves or racks. Such products will not take up much space, but they will serve as organizers for books, magazines or documents. It is the latter that is found in design projects most often. 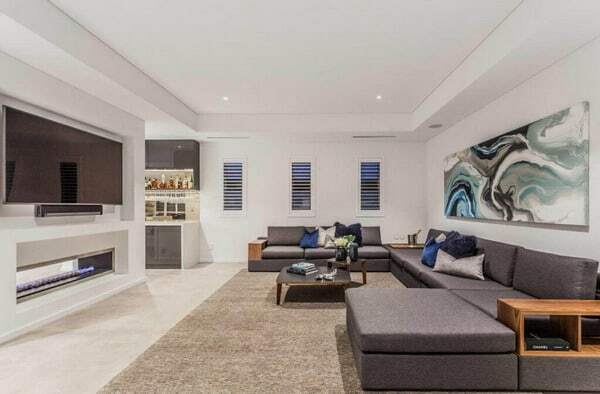 And for good reason – this style has many features that meet the design criteria of a modern living room. It assumes a laconic design, which at the same time will ensure a comfortable stay for the owners of the house and their guests. 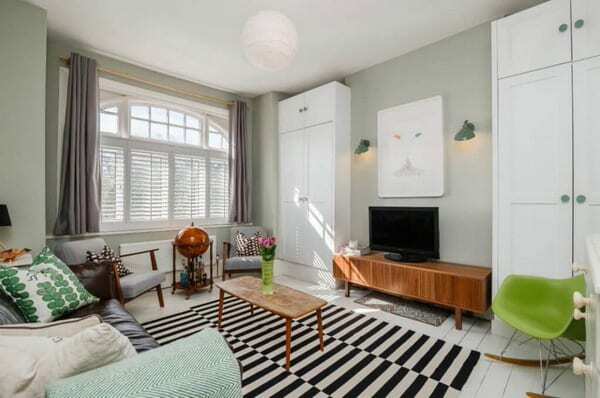 This style tends to minimalism, a lot of natural light and light decoration of the room. 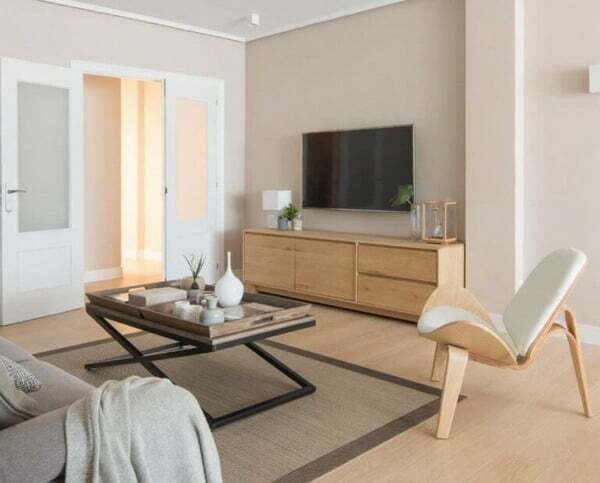 In addition, he promotes the use of natural materials and a large number of wooden furniture, which is also considered the basis for organizing a living room. The first thing to do to bring the room style closer to the Scandinavian one is to add more sunshine. Most often this can be done if you abandon the large thick and dark curtains. If in the bedroom such an element performs a practical function – it protects you from early awakening due to the sunrise, for the living room they are an exclusively decorative detail of the interior. Replace them can be popular now with curtains or blinds. But even better – completely abandon them so that the light can easily penetrate the room. As for the decoration of walls, ceiling and floor – then, as mentioned above, it is best to perform it in a light shade. Many designers recommend the use of white wallpaper and floor, imitating light tree species. To make the room not look too simple and monotonous, you can add a contrasting black or dark gray color to the furniture. Such an interior is universal due to its colors. In addition, it is safe to add bright spots in the form of various decorative elements – pillows, rugs, carpets, vases, etc. Changing the accent colors, you will betray the living room a different mood. Choose upholstered furniture from natural fabrics to make the interior look expensive and stylish. 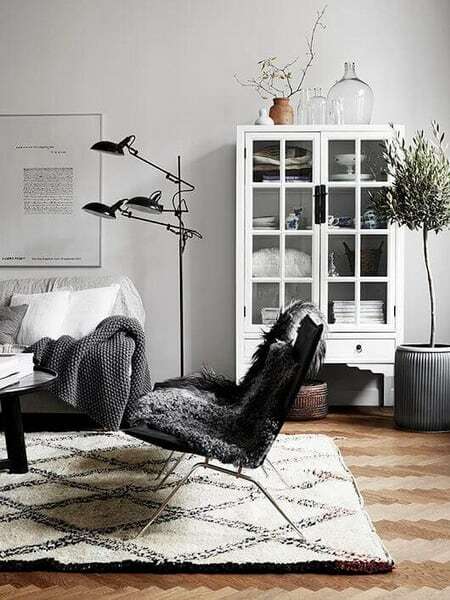 However, remember that for the Scandinavian style is expensive – does not mean luxurious. He is still more committed to simplicity and minimalism. Therefore, eliminate all the defiant details of the decor and try not to clog the space with unnecessary objects. The second place in popularity in recent times is the loft style. For a long time he was considered exclusively masculine, more specifically, a “bachelor” version of the organization of the room, but today he was able to prove his versatility. From the outset, the loft was conceived as a style for the former industrial premises, which were altered as apartments. But today, in order for your living room to have a similar production charm, it is important to have high ceilings and a large area. They are the main starting components of the loft. The most popular technique used by many designers is an accent wall made of bricks. Its essence lies in the fact that one of the walls of the room is chosen (preferably the largest) and brickwork is located on its square. It can be native (construction), but for this the surface must be well processed, and it can be made from a special material that imitates brick. Concrete walls and ceilings with overlapping, intentionally exposed electrical wiring are also considered elements of the style. All of them have one very important advantage – the ability to visually expand the space of the room. In addition, the sun’s rays, falling into the living room, will beat off the light walls, more and more filling the room with light. Such shades have a fairly wide palette, so it will be easy to pick up the final color. Another advantage is compatibility with any other colors. In a room with white or beige walls, you can place some bright (fuchsia, turquoise, etc.) or wood furniture or decor elements. All of them will look spectacular and will be the highlight of your living room. Separately it is necessary to say about the white tone. It became so popular, among other things, thanks to the proliferation of the Scandinavian style, in which white walls and ceilings are the main component. If we talk about other variations of the color solution, then most often there are rooms for rest, made in cold shades. Blue, green or purple can be both a base and a bright accent of the living room. 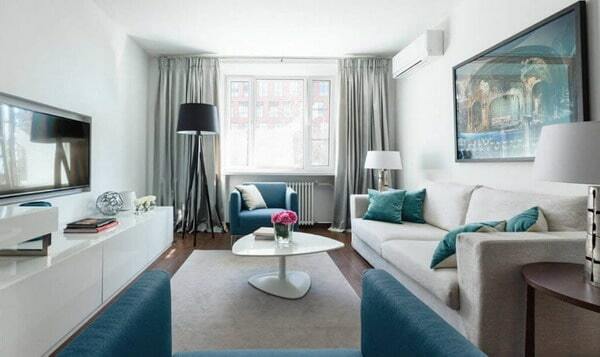 For example, placing a bright dark blue sofa in it will give the room grace and stylish appearance. By the way, blue and blue (from light to dark) – perhaps the second most popular after the traditional light backgrounds. Very often they are used for wall decoration. Moreover, not only pastel and light versions are used – many designers advise making a large living room in deep dark blue. In this case, in order to maintain a cozy atmosphere in the room, it is recommended to use furniture of warm wood in its design. In this case, you can achieve the right balance and “warm” your room a little. The option with dark blue or dark green walls is not for everyone. It will be appropriate only when the windows of your room face the sunny side, providing the space with the light it needs. If the sunbeams are infrequent guests in your living room, it is better to give preference to warmer tones – with yellow or orange walls, if you choose the right shade, they will create a good mood and will give a charge of cheerfulness. It often happens that the mood in the room is created not by the main pieces of furniture, but by the original elements of the decor. Especially in the event that the decoration of the room is made in the now popular neutral light colors. 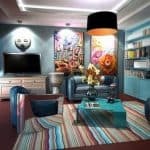 By adding some bright colors, you will bring some originality and uniqueness to your interior. It can be beautiful pillows on the couch, large vases, carpets, clocks or posters. In combination with white walls and light furniture, they will stand out favorably, transforming the space around them. The same effect can be achieved with the help of lighting. Both the main central chandelier and additional lamps in the room are capable of emphasizing one or another of its parts. And, although such things do not carry any basic practical function, they perform an important role in the general ensemble of the living room. After all, sometimes, depending on the overall concept, it is around them that designers equip other zones. Light is a very important part of creating a cozy and homely atmosphere. And the original lighting can be a bright accent, attracting the attention of your guests. In the appearance of the main source of light, there are no restrictions – choose a chandelier that you liked the most and that fits into the big picture as best you can. It can be both modest and massive intricate options. As for additional lighting fixtures, then their number should be adjusted primarily depending on the size of your living room. If wall sconces are more suitable for the bedroom, then you can install beautiful floor lamps here. They will serve as a source of local illumination, highlighting this or that zone. Most often they are installed near a chair or sofa. This creates a segment for reading, and you can spend evenings with an interesting book. For those who want to stand out and arrange the living room as original as possible, you can install special garlands. These are not the New Year lights that flicker on the Christmas tree before the New Year – many manufacturers today produce models that can give enough light for a comfortable stay in the room at any time of the day. 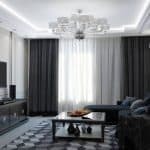 If you have divided the living room into several functional zones, try to think it over so that each of these zones has its own separate lighting for greater convenience. 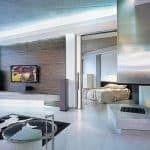 Many, by the way, use lighting for zoning a room. Large areas are more suitable for installing perimeter lighting with special lamps. In the studio apartment where the living room is combined with the kitchen, in the area where the cooking takes place, it is necessary to install a separate lighting fixture for better visibility. And for the dining room and living room is better to choose one separate chandelier, which would be located in the center. Directly in a place designed for relaxation, you can arrange beautiful floor lamps, and for a working corner to pick up a stylish desk lamp. A traditional element of the living room is considered to be a coffee table, which is located near the armchairs or the sofa. If the area is quite large, you can place several such tables on it. Moreover, it is not necessary to make them all resemble each other. Original and unusual look coffee tables of different colors and sizes. The main thing – that they fit into the overall interior. By the way, it should be noted that the hand-made coffee tables are especially characteristic of the loft style. They can be constructed from pallets that remain from construction work. This element looks quite unusual, which attracts people’s attention. In addition, these tables do not require the application of paint – their feature is the opposite – in natural wood shade. Another original idea is a soft pouf as tables for magazines. Putting a tray on it, you turn the piece of upholstered furniture into a stylish table, and if necessary, the tray can be removed to use the pouf for its intended purpose. Large role for the design of a modern living room play plants. What has live, not artificial counterparts. They refresh the room, as if filling it with air. And with neutral walls can serve as a very bright accent. Purchase original pots, a special rack or beautiful wicker baskets to transform a room for rest. As you can see, there are many ways to make your living room not only beautiful, but also a cozy, atmospheric and stylish room, where you can relax after a hard day’s work. And it doesn’t matter how big its area is – with the help of competent zoning, minimal furniture and the use of mainly functional items you can visually expand it. And thanks to bright accents in the form of decorative elements, you can create a unique interior that will delight you for many years.